Hot tip for photobook junkies. Powell's in Portland is currently stocking remaindered copies of Errata's Books On Books series. There are quite a few to choose from. You can see exactly what's available here. Although the Powell's site lists them as Used, they are in fact brand new, no remainder marks, shrinkwrapped at $18.95 apiece. That's less than half list price. I'm not sure how Powell's wound up with these but they've only got a few copies of each title. So if you've had your eye on a specific Errata book, now may be the time to bite, especially if you live near Portland. I picked up Bad Weather (sorry, last copy) and 60 Fotos yesterday. Bad Weather has always been my favorite Parr book. The photos are quick and raw and frosty, with none of the garish glitz of his recent stuff. As for the mysterious Moholy-Nagy, he's always seemed one step ahead of the game. Although he worked with photos, I think at heart he was a graphic designer, and a very good one. 60 Fotos was initially published in 1930, before various photographic camps and genres had begun to solidify. It's a free form stream of pictures, negatives, photograms, and collage, all blended into a sort of boundary busting book stew. Super eclectic and right up my alley. Why are there so few books like that being made today? What this means for Errata Editions is anyone's guess. It's been over two years since their last book came out. They've posted a few events on social media since then, but nary a peep about upcoming books. Ed Grazda just came out with his own book Mean Streets, and Jeff Ladd is busy with young kids, and making new photos in Germany, so one can assume they are consumed with non-Errata stuff. But does this mean Errata has run its course? Unclear. All I know is it's generally not a good sign when a publisher relegates half its back catalog to the remainder shelf. I've griped here plenty about the inaccessibility of out-of-print photobooks. No need to rehash all that again. Errata's raison d'être — "dedicated do making rare and out-of-print photography books accessible to students and photobook enthusiasts"— states the problem clearly, a view closely aligned with my own. If someone's resurfacing old books, I'm in their corner all the way. That said, Errata has never fully satisfied my out-of-print book itch. Don't get me wrong. I love their books. I own several. But they've always felt more like academic studies than actual photobooks. They're a bit on the small side, the idiosyncrasies scraped clean, a shadow of the originals. Mind you, they are great for what they are, but I often find myself just wanting to see and hold the actual photobook dangit. Errata feels like an old film that's been pirated 2nd hand from a movie screen. Fun to watch but in the end I'm even more hungry for the projected version. Or something like that. I can't help wondering how much the good ol' Internet has effected Errata. Many out-of-print titles can now be viewed page-for-page on Youtube or Vimeo, while sites like Josef Chladek's reproduce photobooks in their entirety as jpgs. These free options sit right in the same target space as Errata, and I think they may have crowded the field for their products. But who really knows. 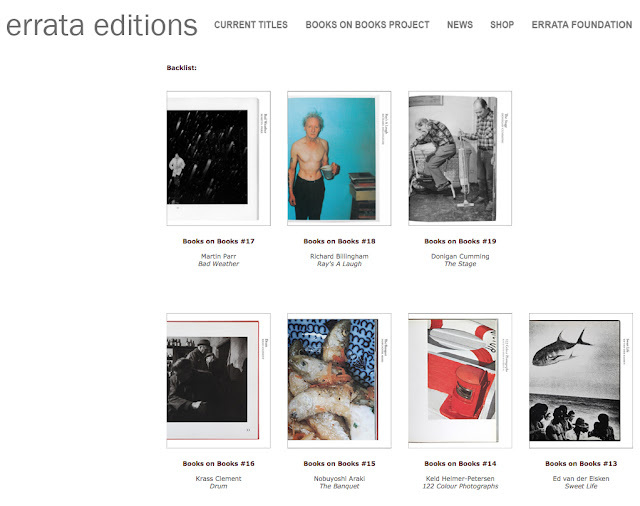 Perhaps in an effort to ward off the digital threat, Errata's titles were deep cuts unlikely to appear online. Kudos to them for shining a light into obscure corners. But frankly, some of those corner were less than exciting. If this is in fact the end of Errata, it's been a fine run. If not, I'm looking forward to whatever's next. Either way I'll probably be back at Powell's next week to see what remainders. Josef Chladek's site usually doesn't reproduce books in their entirety, there's typically a few spreads but rarely do you get to see the whole book. This is one of the things that make it such a great site. It gives you a taste of the books but doesn't reveal the whole thing, like watching a good trailer for a film that doesn't reveal the entire plot. Sorry to snag the last one, Kyle. I haven't made it back since. Hopefully there are still some other Errata books in stock? Decades ago, my father was amused by Bad Weather when he noticed a pile of remaindered copies in some otherwise charmless provincial bookshop. Though he never normally bought photobooks, he made an exception for this. I'm happy to have inherited his copy (which probably cost quite a lot less than a humdrum new Penguin).